Studying the Psalms is a good way to reflect upon the goodness of the Lord. They are the best collection of poems and songs ever published and the greatest thing is that they are all Holy Spirit inspired! As you study the Psalms you learn that King David of Israel wrote many of them, such as in the case of Psalm 37. He was an old man when he wrote this Psalm (37:25). Reading through the Psalms and some other books of the Bible such as 1 & 2 Samuel and 1 & 2 Chronicles you will learn that the words of this Psalm were written by a man who spent many years hiding and escaping from people such as the wicked King Saul. The clear message in this Psalm is to teach how we should respond to other people even after we have been treated unjustly. David encourages the reader to continue to do right, submit to the Lord and trust Him to deliver justice to the evildoers. We must delight in the Lord and know that He will bring it to pass. Here are some of the truths that I have found that should help you to D-E-L-I-G-H-T yourself in the Lord. When we are in the depths of despair it is so hard to get our eyes off of the problem and keep them on the solution. Jesus is the solution because our faith in Him promises so much more than this world can ever give. God promises to take care of us and even though He will care for us when we are doing things that do not please Him, throughout His word He encourages us to do good and not evil (Matt 5:16, Rom 2:6-10, Gal 5:19-26, Gal 6:9, Eph 2:10). God promises to destroy evildoers. Our current judicial system is based upon the laws of God. He is a just God and although it seems that sometimes evildoers are blessed in this world, should they continue in their evil ways and never trust Jesus as Savior they will be “cut off” from God and they will not win (Ps 92:7, 101:8, Prov 21:15, Matt 12:36-37, Rom 13:4, Rev 21:8). Fighting against the evil of the world causes us to become very weak. Isn’t it great to know that God is our strength in times of trouble? He is our shield (Ps 28:7). He increases our power when we are weak (Is 40:29). He is our strong tower (Prov 18:10). His power is made strong in our weakness (2 Cor 12:9-10). We can do all things through Him (Phil 4:13). These few verses are full of promises. He promises to give us a place to live with the physical nourishment of food. Consider this: that dwelling place is more than our Lord Jesus had during His earthly ministry. He spoke of this in Matthew 8:20 when He said “…The foxes have holes, and the birds of the air have nests; but the Son of man hath not where to lay his head.” We are also promised to obtain the desires of our heart, but that comes with conditions. 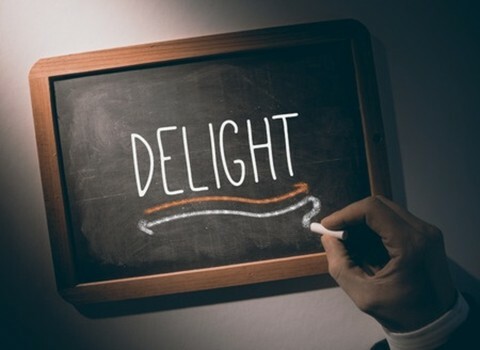 We are encouraged to “delight” in the LORD as one condition. Other conditions are that we should “commit thy way” unto the LORD as well as “trust” in Him and then He will bring it to pass. A command and a promise, how delightful! You can “D-E-L-I-G-H-T Yourself in the Lord” when you realize that doing good is always the right choice, evildoers never really win in the end, God’s love is amazing and never fails, and your eternal life is a guarantee that is sealed on the day you believe in what Jesus went to the cross to do for you. In good times and in bad you can count on the fact that God is your strength, He won’t let you fall and you can trust Him to deliver upon every promise that He ever makes. God is not a man, that he should lie (Num 23:19a). Delighting in the Lord is an attitude that says “I am God’s child and He’s got my back”. Now that is delightful! One of my favourite Psalms. Mine too David, in fact Psalm 37:4 is the life verse that one of my daughter’s has chosen. When she graduated home school several years ago it was the theme verse at her graduation service. Next post: Were There Giants in the Bible? Who Were the Nephilim?